However, with the government’s target of reforming deeply the business environment, motivating the sustainable growth of enterprises, improving effectiveness and competition capability, the 2014 Enterprise Law is again reviewed to revise, upgrade, and to make it more practical. Starting a business is the process since the investors start the first step of the procedure to the time they can operate the business. 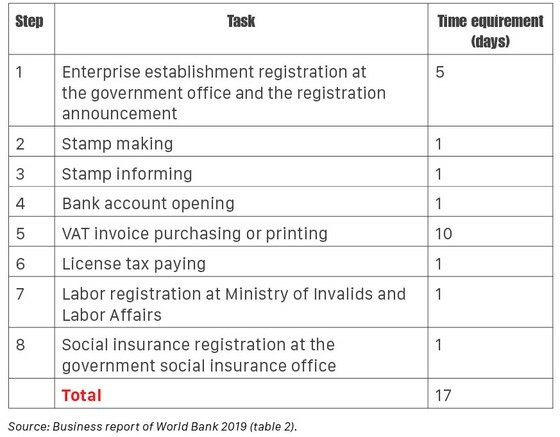 If this process is determined by the documents and time required by the procedure of 8 steps, it totally takes nearly 20 working days, excluding the waiting time and holidays (details are in Table 2). Comparing to the regional and international procedures, the process for enterprise establishment in Vietnam is too complicated and consumes a lot of time and money. 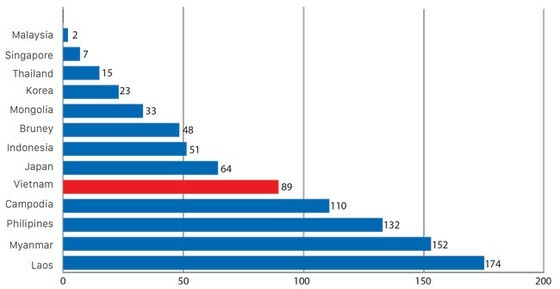 According to the ranking of World Bank in 2019, Vietnam ranks 104 out of 190 countries in starting a business. The revision of Enterprise Law this time is expected to continue creating significant changes about the mechanism, open a new path for the development of the economy. Hence, this revision will be strongly, completely for the purposes of safety, professionalism and cost saving. Based on this current status, a strong revolution is needed to cut the unnecessary procedure for saving enterprises’ time and money. The government should delete some steps related to stamp, labor registration and so on. At the same time, the government should reduce the time for purchasing and printing of VAT invoice. The government should also encourage enterprises to use internet invoice. It should change the way of implementing some steps related to bank account informing and license tax paying. Instead of requiring a separated step for paying the license tax, the government should give enterprises more flexible time. The step of banking account informing should be implemented when enterprises summit documents to the tax offices. However, to implement these improvements completely, the government should not only revise the Enterprise Law but also the Tax and Labor Law. Shareholders protecting is an important issue in enterprise management. Completing the regulations to protect shareholders is important in creating a safety business environment and encouraging investment activities. The key points of regulations on protecting shareholders are to maintain the fairness between all shareholders, and to protect the legal rights and benefits of shareholders. Comparing to the Enterprise Law 2005, the Enterprise Law in 2014 created a big jump. There was a strong improvement in protecting the rights of shareholders in the Enterprise Law. In 2015 Vietnam ranked 89 out of 190 countries for this measurement (compared to ranking of 117 in 2014 and 169 in 2013). However, comparing to other regional countries, Vietnam is far below Indonesia – the most comparable country; also far below Thai Lan, Singapore and Malaysia. The implementation of the Enterprise Law into practice shows that some regulations do not truly create a favorable condition for shareholders to implement their rights. There are also some regulations that create the intangible barriers for shareholders to claim their legal rights or to protect shareholders from the loss causing by the abuse of some big shareholders or the company. The revision of the Enterprise Law will focus on completing the mechanism for shareholder protection, by expanding the rights of investors, by creating favorable condition for shareholders to do their rights, and by increasing the responsibilities of the members of Board of Director as well as the Board of Management. For example, the revised law will delete the restriction on the holding maturity of shareholder which are stated in Clause 2 of Article 114, Clause 4 of Article 149 and Clause 1 of Article 161. The longer target of law revision is to improve the corporate governance, to make it good and professional, and to motivate and attract the social investment as well as the direct investment into production and operation for the economy development. The other big issue currently discussed is how to revise the Enterprise Law to create the path for developing household business. According to General Statistic Office, Vietnam had 5.14mn household businesses at the end of 2017 and the total number increased gradually year on year. The issue is, comparing to the enterprises, the household businesses are currently restricted in many dimensions, such as the operating areas, the sectors of operation, the invoice types and so on. Reversely, the household businesses have easier legal frame and it is more suitable with the nature of simple and small businesses. Therefore, some household businesses have big scale, even much bigger than enterprises, but operate under the form of household business. Based on this current status, the revision of the Enterprise Law should untie some restrictions on the rights of household businesses. On the other hand, the government should create a mechanism to encourage the big household businesses to transfer to enterprise format, which help to create a fair business environment. Further, revising only the Enterprise Law is not enough, it is also needed to revise the other related regulations like tax, invoice, labor… to completely create a fair business environment. Lastly, the implementation of the law into practice should be by the nature and size of the business, not by the legal enterprise type.